We have been busy making ocean/beach crafts lately and made this Handprint Crab to go along with the theme. 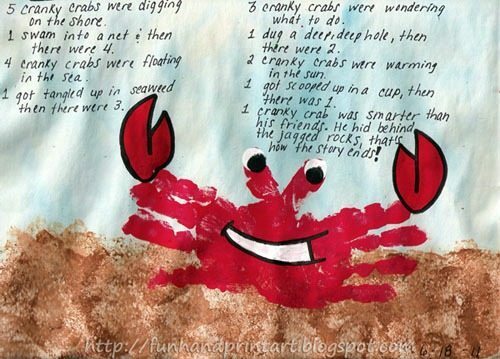 It also features a cute, crabby song that kids are sure to get a kick out of! On a plain piece of paper, draw a line horizontally- the top will be the sky/ocean and the bottom will be the sandy beach. Use blue watercolor to paint the top section. If you don’t have watercolors, you can always water down regular blue paint. To make the sandy beach, you will need a sponge. Dip the sponge in brown paint and dab off the excess paint on a different sheet of paper. Have the child lightly blot the sponge on the bottom part of the page. Repeat this same process with a tan color. Next, paint one hand with red paint and press it in the center and so it overlaps both the water and the sand. 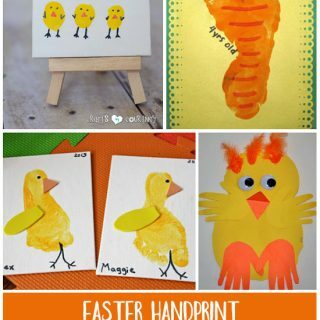 Paint the other hand red and press it down so it slightly overlaps te palm area of the other handprint. When it dries, use white thumbprints to make the eyes and addca white mouth. When that, dries, use the pinky finger to make the black part of each eye. Optional: outline the mouth and claws black. We also added a cute song about crabs for my son to sing. The title got cut off by my scanner, but it’s called Cranky Crabs. I would have printed it, but m printer ran out of ink! It’s perfect for my son because he loves the 5 Little Monkeys song and this one is sung the same way. Here is how the song goes except when I wrote it on our craft, I wrote the numbers on instead of the words to make it easier for my son to remember/pretend to read it himself…. tee, hee! Five cranky crabs were digging on the shore. One swam into a net and then there were four. Four cranky crabs were floating in the sea. One got tangled up in seaweed, then there were three. Three cranky crabs were wondering what to do. One dug a deep, deep hole, then there were two. Two cranky crabs were warming in the sun. One got scooped up in a cup, then there was one. One cranky crab was smarter than his friends. That’s how the story ends! Stop by our Sizzlin’ Summertime Fun board on Pinterest for more fun ideas! I love this idea! We are also working on a beach theme and this is perfect. Thanks!! I can’t wait to do this next week, it fits in perfectly with our underwater theme! That is so cute! Love the handprint crab!!! i’m at the beach with my kids now, so the crab couldn’t be more perfect. i’ll let you know how it turns out, yours usually look (way) better than mine do! ok our handprint crabs were more process than results. linking up to your version in my august crafts post, going live tonight! Thanks for the inspiration…we have had fun at playgroup making our own crabs. Sounds like a fun playdate! So cute! I’d love it if you shared this with the Fun Family Crafts audience. FFC is similar to Craftgawker but it only features kid friendly tutorials. 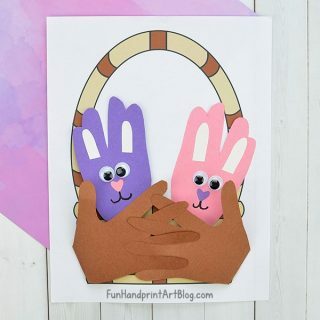 Looking forward to seeing what fun crafts you submit! This is planned as part of our June lesson!